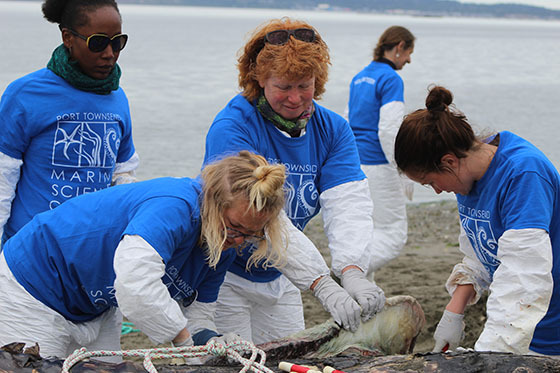 Port Townsend, Washington, May 23, 2016 — A team from the Port Townsend Marine Science Center (PTMSC) collected the carcass of a juvenile gray whale from a site on Indian Island Wednesday, May 18. The Marine Science Center plans to articulate the skeleton for educational use in their classes and exhibits. The juvenile gray whale, a female likely two- to four-years old, was first sighted alive in late April in central Puget Sound having difficulty swimming and diving as a result of an injury or illness that had trapped gases in the upper part of its body. Biologists and veterinarians suspected the whale may have been suffering from an infection that produced gas inside its body or a pneumothorax – a collapsed lung – that had filled its chest cavity with air. Either condition could have made the animal too buoyant to dive. Because gray whales feed by diving to the sea floor and sifting sediment for small marine organisms, such as tiny crustaceans, the animal’s injuries compromised its likelihood of survival. On May 8, the whale, identified as CRC-1524, was found dead in Elliott Bay near downtown Seattle. Cascadia Research Collective and the Washington Department of Natural Resources towed the whale’s carcass on May 11 to a site on Indian Island provided by the U.S. Navy for the necropsy. PTMSC staff and AmeriCorps members assisted in the necropsy, the results of which will help NOAA Fisheries understand the whale’s injuries and the cause of death, which could provide insight into the health risks affecting gray whales. On Wednesday, May 18, a team of 20 volunteers and PTMSC staff members, with marine mammal veterinarian Dr. Pete Schroeder of the National Marine Mammal Foundation advising, prepared the carcass for controlled decomposition by removing the entrails, pectoral fins, and baleen before wrapping the 30-foot whale in Spectra netting, contributed by a community member, and sinking it offshore. Anchored underwater, the whale will decompose naturally for one-to-two years, after which, contained in the netting, the skeletal remains will be retrieved, cleaned, and prepped for full articulation. Hope’s articulated skeleton became the focus of the orca exhibit at the Port Townsend Marine Science Center to raise awareness of orcas, the threats they face, and things we can do to help them survive. The Port Townsend Marine Science Center is excited and honored to embark on a similar community-oriented project with gray whale CRC-1524 to provide a greater understanding and awareness of these immense creatures with which we share the waters of the Salish Sea. The Port Townsend Marine Science Center thanks NOAA Fisheries for offering use of the whale skeleton for educational purposes, the U.S. Navy for their efficient assistance on site, Dr. Pete Schroeder for his expertise and guidance in preparing the whale, and the countless individuals, groups, and agencies that assisted in monitoring and towing the whale or supporting the effort, including Cascadia Research Collective, Washington Department of Fish and Wildlife’s Marine Mammal Investigations, Washington Department of Fish and Wildlife’s Enforcement, Washington State Parks, Washington Department of Natural Resources, U.S. Coast Guard, Seal Sitters, MaST, Orca Network, Seattle Aquarium, and the SeaDoc Society. Read the full article from the May 25 issue of the Port Townsend Leader. Read the full article from the May 26 issue of the Peninsula Daily News. See more photos in Marine Mammal Stranding Educator Katie Conroy's blog post!